Imagine you are fly fishing, and you’re standing all alone at the end of a Texas Gulf Coast jetties somewhere (see the map), and you’re visited by fish from another planet. As I struggle to describe what I saw last week, about the only descriptions that come to mind are straight out of science fiction books or movies. Perhaps I was delusional (no drugs were consumed) after being on the jetties all day, casually casting the 10-weight Z-Axis to keep my arm from completely locking up (whoever said casting a 10 all day is the all same as casting a 2 all day is capital L O C O) and falling off. Flies? I threw everything in the box – big bait, smaller Clousers and even some of my tarpon toads. Conditions? The water was calm, so calm in fact that the heat of the day was inescapable, and had me taking breaks for cover under the tower of the channel marker at the end of the jetties walkway. Long, ceaseless lines of finger length mullet were there to greet me when I arrived before noon. At distant angles, they looked like a dark, narrow cloud running close to the granite rocks. Looking straight down at them, they shimmered by the hundreds of thousands – for hours. The tide wasn’t going to move for quite some time, so the casting was blind, and mostly for the exercise, which I needed in a painful way. I would occasionally venture beyond the tower, boulder hopping toward the very end of the jetties, well aware that there would be no one to save me should a freak wave do its deed. There was no one around, and that alone qualifies as luck – in my world. Even though conditions were perfect, there was no bite for hours on end, enough time to play every variable I knew; vary retrieve speed, change flies, change leaders, work the column, change locations … take a break. As the heat of the day started to press down, storms started to pop up out on the water and inland. Secretly, I hoped this game might get rained out. Nope. I fished through the dark clouds, sprinkles, and overcast waters. Still no bite, just insane humidity. “The water’s gotta’ move,” I kept saying to no one there. A slack tide is slack tide, and the changes weren’t going to be too extreme anyway. Even the mullet clouds were losing steam, free from moving tides, in control and free to move about. According to Scott Sommerlatte, that means advantage bait – disadvantage gamefish. Part of what makes a tidal feed is the disorientation caused by moving tides – advantage gamefish. It was getting late, and the distant storms were getting worse, but still staying distant. The sun was formally gone for the day, behind the cloud banks. By the clock, it was still tidally early, by my clock, I was winding down. I took myself boulder hopping for about the fifth time, something I would never suggest doing solo – unless you are extremely capable. I saw this one protruding, flat piece of granite, angled out at about a 45-degree angle, just enough to create an eddy in front of it, and the flat surface perfect for laying line. The tide was finally moving again, and forcing those shimmering fingerlings into formation, once again a tight narrow cloud band running the entire length of the jetties. At the end of the jetties I saw a commotion, bait splattering like bugs on a windshield. Not nervous bait, stalked bait. Suddenly, at about forty feet, I see silver flashes rolling and shattering the serenity. As they got closer I see what I’ve been waiting for; a school of huge, and I mean huge, jack crevalle were coming in. As they got even closer, they looked like fish from another planet. They were moving in a coordinated manner that looks like they were contained inside a clear tube, three feet in diameter, and they’re rolling (as in corkscrewing), tumbling and turning. Their bellies as likely on top of the water’s surface, as any other body part. They looked like a giant auger drill bit, cutting through bait like it wasn’t event there, like stealth fighters in a weightless, circular dogfight. They were wolves, not fish. They kept coming and in a split second arrived at my feet, and stopped in the ebb created by this rock I was on. So I am looking down about nine feet from my eyes, and another five feet below the surface of the water, frozen by the sight of about ten jacks in the 20-40 pound class range, just sitting there motionless. I dapped my black Abby-Clouser, but before I could get it to sink, they launched like fighters on afterburners and were gone. The day was done, the show over. As I was leaving, I could imagine another day here, with more schools of these wolves, and having many, MANY more shots at these guys – if there were just more schools of them around. What I couldn’t imagine was what would’ve happened if I had hooked one of these on my “little” ten weight this day. Next time it will be a lot more watching, and waiting, maybe a lawn chair kind of adventure with lots more to eat and drink … and wait … with a twelve weight rod in hand. One thing is sure: THERE WILL BE A NEXT TIME! 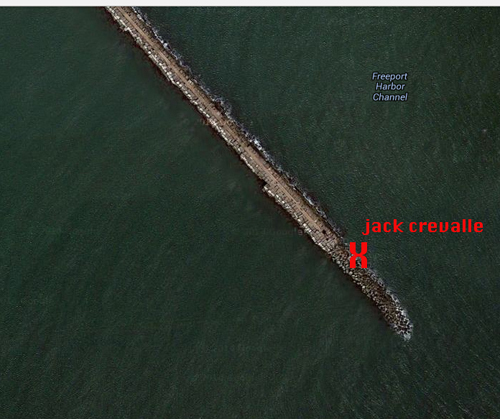 NOTE: You will be sent through a bit of a maze to arrive near the jetties at Surfside, Texas – the SOUTH jetty. You certainly want to be on the SOUTH jetty. Second street leads right up to the jetties, and this jetty is extremely civilized, with a wide paved sidewalk running nearly the entire length – which is shorter than most. I have never been on an easier jetty on the Texas Gulf Coast (yet). Once you are on the granite, the usual precautions are obviously necessary – wet rock is slippery. This particular day, it was so calm, all the rocks were dry.